The rollout of the AW139s to replace the S76As on the Royal Australian Air Force contract has picked up pace with the arrival of the VH-RQZ in Australia. The aircraft arrived in September at the port of Fremantle, and after a modifications program at the Jandakot Airport, it was flown to its new home at RAAF Pearce base, in Perth’s northern suburbs by Manager of Flight Operations Lance Tantum and Head of Check and Training Guy Jackson. The team at RAAF Pearce are now undergoing a training program on the new aircraft, that includes wet winching training off the coast of Perth (photo to come on Friday). 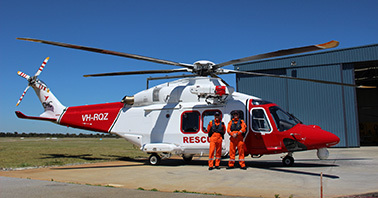 The RAAF Pearce machine joins VH-SYZ, which is stationed at RAAF East Sale base in Victoria, and VH-NVE which is on contract to the Australian Navy at the Albatross base in Nowra, New South Wales. The next AW139 aircraft for RAAF Amberley in Queensland are due to arrive in Australia in November and will go onto the contract at the end of the year. The bases at Williamtown in New South Wales and Tindal in the Northern Territory will follow after that.